What is a Treasure Hunt? How much does a treasure hunt cost? As technology continues to improve at an exponential rate, using tech to take part in treasure hunt activities using gadgets and gizmos is becoming more and more accessible. Around the world there is a hidden network of over a million boxes with treasure concealed within. Geocaches can be found with the assistance of GPS enabled equipment. The idea is that you exchange what is in the box with something of equal or higher value. If you’ve got an iPhone or an Android with GPS capabilities, search the app store for geocache and see what treasures you can find. They are EVERYWHERE! A simple guide to making a treasure hunt around your home. Includes making a great old looking treasure map. Click BUY IT NOW and come back here. You will be sent a link via email when the payment is accepted. 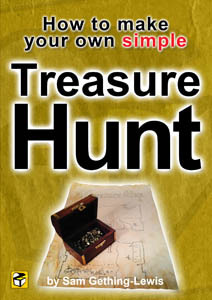 If you would like to have a treasure hunt design please email us. We would love to help you with your treasure hunt! Good luck with your treasure hunt! © 2016, Wordsearch Ltd. Treasure Hunt Design is an online trading name of Wordsearch Ltd, Registered in England and Wales no 7761245.